I am a folk artist or, also, called a self-taught artist since I haven't had any formal art training. I have always loved artwork and found creative outlets in my life. I love gardening and am a Master Gardener which has been a way to use composition, color and texture. This has allowed me to teach how to use herbs in cooking and making herb wreaths plus flower arranging and making terrariums. My wreath making over the years has let me experiment with many different mediums. The components of my wreaths are just about anything that catches my eye or imagination, such as, buttons, toys, feathers, faux jewels and furs, dried and silk flowers, and much more. Most recently I've concentrated on shell wreaths which have been well- accepted for their different style. Until 2004 I'd only used watercolors and then was inspired to try acrylics. My style with the dots is unique and of my own invention. 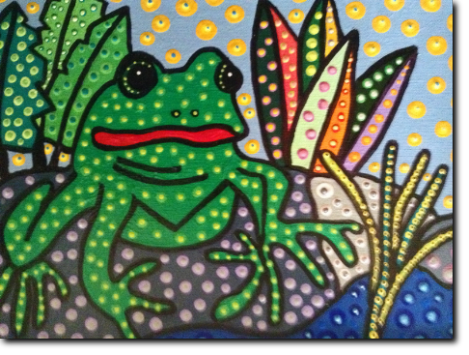 My paintings are bright, different and funky. The subject matter could be from anything but seems to keep getting back to the garden. Spending part of the year in Costa Rica, I am inspired by the tropical plants and flora plus the fish and frogs. Everything I paint starts out as a fun idea and I never know how it is going to turn out. There are lots of layers of paint which adds texture to the finished pieces. Many colors are used in each painting and it takes a surprisingly long time to finish each painting. It looks so simple that people have said "I could do that" and I say "Do it, its fun and gets your right brain working. It teaches you to really observe all the different colors and shades vs. thinking a leaf as just green". I've had a great time playing with my paints and will wait and see where the creative winds will take me next. Thank you, again, for taking a minute to see what I see.